If you’re searching for a career that doesn’t require you to sit in an office all day, look no further than Construction and Real Estate. Charlotte’s construction and real estate industries are booming as new people and companies seek to relocate. Careers in both construction and real estate are dynamic, fast-paced and offer livable wages and career growth potential. There are many construction jobs that span throughout the construction process, from designing and planning buildings and homes to erecting structures to maintaining and inspecting existing structures. The real estate industry is ideal for those who have great sales skills, like interior design and property management. Download the Occupation Spotlight Document’s for each occupation you are interested in learning more about. 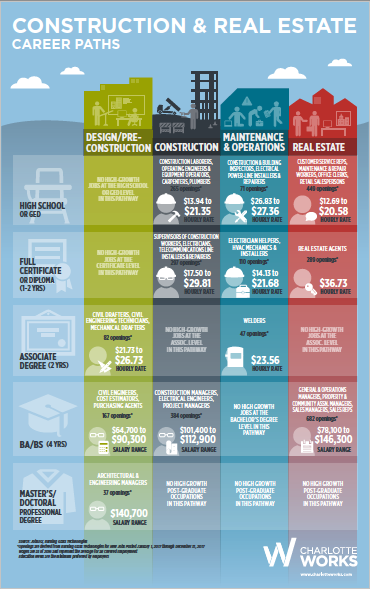 Our Career Ladder outlines each Career Path available in the Construction and Real Estate industry for every level of education. Download the career ladder to discover where your career in Construction and Real Estate can start today!